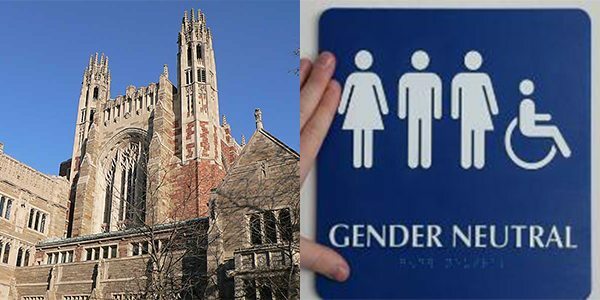 Yale University has made sure visitors at the school’s 315th commencement will notice something new on campus this year as the university embraces transgender students by introducing gender-neutral bathroom in 23 buildings. The school is promoting the bathrooms, which were unveiled last November, on its website for Monday’s commencement, complete with a link to a map showing where they can be found. Yale’s Equal Opportunity Statement, which covers all students and employees, has since 2006 prohibited discrimination based upon gender identity or expression in admission, education and employment. But Isaac Amend, a rising senior who is transitioning to male, said he and other members of the transgender community noticed a big difference at Yale after Caitlyn Jenner’s transition brought transgender issues into the national spotlight. ‘I’m pretty sure that if you take any year in Yale history and measure the amount of change that happened with regards to trans rights, this has been the most monumental year, by a lot,’ Amend said. Professors are now using preferred pronouns when addressing students, and the school is allowing transgender students to change their names on their school identification card and the school’s web portal at no charge, he said.